Check out the amazing kitchen layout at Northlands Parkway Collegiate in Winkler,MB. 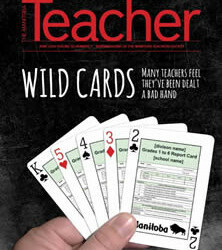 The Manitoba Teacher is the news magazine of The Manitoba Teachers’ Society, the professional and collective bargaining representative for the province’s 15,000 public school teachers. The Teacher is published seven times a year (September–June) by the publications department of MTS. It has a circulation of 17,500.